How do I create group package deals? /Creating, Editing and Managing Events /How do I create group package deals? 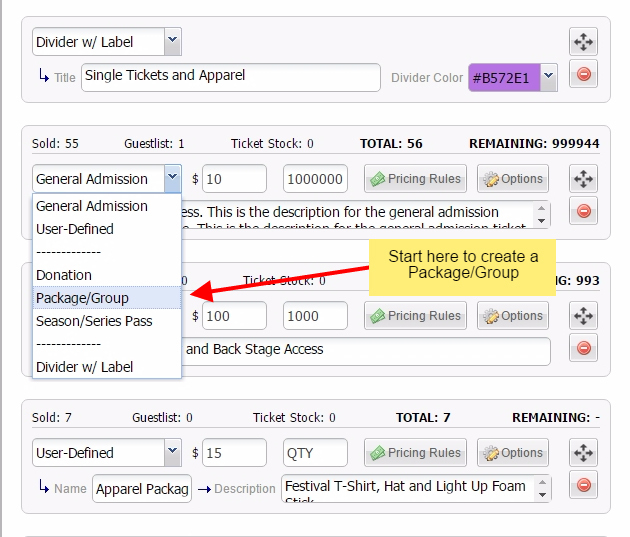 You can easily create a package within your event by adding a new ticket type and choosing the option “Group/Package”. You are able to set all of the same options as you would for a normal ticket type. The main difference is at the bottom you will be able to define which other ticket types within the same event will be included in the package. For example, let’s say you are selling tickets for a weekend event which is Saturday and Sunday. You want to sell tickets individually and then you want to sell a weekend pass which gives a separate Friday and Saturday ticket. You would add a “Group/Package” ticket type, set the price of the weekend pass, and add one Friday ticket and one Saturday ticket. When the customer purchases this package, they will receive two separate tickets. Another example would be to offer a special discount offer. Let’s say you want to offer a deal where if the customer purchases a 4 pack of tickets, they will receive a 5th ticket free. If the tickets were $25 each, you can simply create a “Group/Package” ticket type, set the price of this package to $100, then have the package include 5 tickets. This way the customer will pay $100 but will receive 5 tickets. You can use this feature in countless ways to create packages and offerings from group discounts, weekend passes, to family discount deals. Be creative! I want certain tickets to go on sale and have the sale stop at certain times. How do I set special start/stop times for various ticket types? How can I add a description and social marketing links to my promoter page? Is there a page where it shows all of my upcoming events? Am I able to see if a customer’s tickets were used at the event? Where can I view details about a particular order? How can I process a refund for a customer?